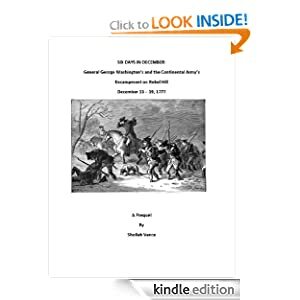 Continental Army’s Encampment on Rebel Hill, December 13 – 19, 1777, (52 pp.) is now available on Amazon.com for $2.99. marched to Valley Forge. The thrilling story of the threshold to Valley Forge. Look for it on line at Barnes and Noble.com soon. This entry was posted in Becoming Valley Forge, George Washington, Gulph Mills, Rebel Hill, Six Days in December on August 27, 2012 by Sheilah Vance.